Taunton is a town in the county of Somerset. It is in the Taunton Deane District. Taunton is the county town of Somerset. Taunton is on the River Tone and takes its name from the river. Tone town became Taunton. In 1685, Judge Jefferies was based in Taunton during the Bloody Assizes that followed the Battle of Sedgemoor. ↑ "Mid Year Population Estimates for Towns" (PDF). Somerset County Council. Retrieved 17 February 2009. 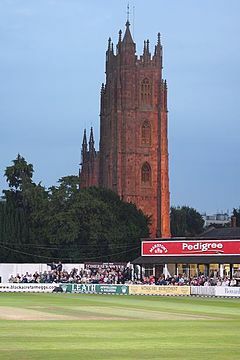 Wikimedia Commons has media related to Taunton, Somerset.